A 73-year-old local man in Shanghai was revived from a coma after taking a "health tonic" found to contain the same active ingredient as Viagra, officials from the No. 411 Hospital of the People's Liberation Army said yesterday. The patient, surnamed Zhang, said a saleswoman went to his neighborhood in Hongkou District a week ago to sell a medicine that she claimed were made from ginseng and Chinese caterpillar fungus, a TCM tonic said to help with immunity and cardiovascular health. 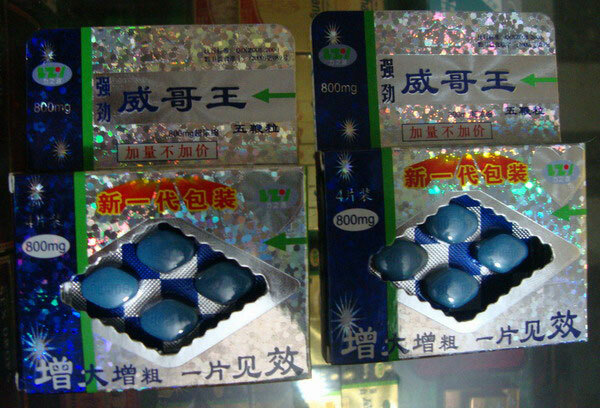 He paid 350 yuan (US$55.56) for four packs and started to take the medicine. He fainted suddenly at home on Monday and was rushed to the hospital, where doctors found that there was no ginseng or caterpillar fungus in the medicine but starch and sildenafil, the main ingredient in Viagra. Doctor Bai Yingtang said the patient suffered a serious adverse reaction since he took drugs for heart disease regularly as well as the sildenafil, which affects blood pressure and the heart. "If he had not received treatment in time, he could have died," Bai said. "The patient has been in stable condition after treatment." Zhang's family found no producer's name or contact on the package and the number left by the saleswoman didn't work. The Shanghai Food and Drug Administration "has been tightening its oversight, but residents, especially the elderly, must be careful about such claims and see a doctor for medicine, including traditional Chinese medicine, instead of purchasing health tonics randomly," said Du Bing, an official with the FDA.